More Product InfoThe 1U D-Ring Cable Management Kit gives Installers and Network Technicians a flexible and functional cable management bracket that will easily manage all types of cables. 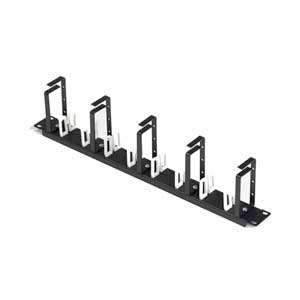 1U D-Ring Cable Management Kits include 16 snap-in plastic clips and 5 specially designed D-rings that attach to a blank panel in 5 different positions. With over 43 different configurations it is easy to manage cables vertically, horizontally, and diagonally. The 1U D-Ring Cable Management Kit eliminates the need for dozens of other cable management brackets. Finally a single cable manager that can do it all.